Whether you’re considering building an outdoor kitchen in your backyard, or you already have one that you want to upgrade, stack stone veneer will help you create a fabulous feature you can use for entertaining and family living. Unlike traditional structures built using natural stone, stack stone veneer is surprisingly easy to install and it is also an economical option. 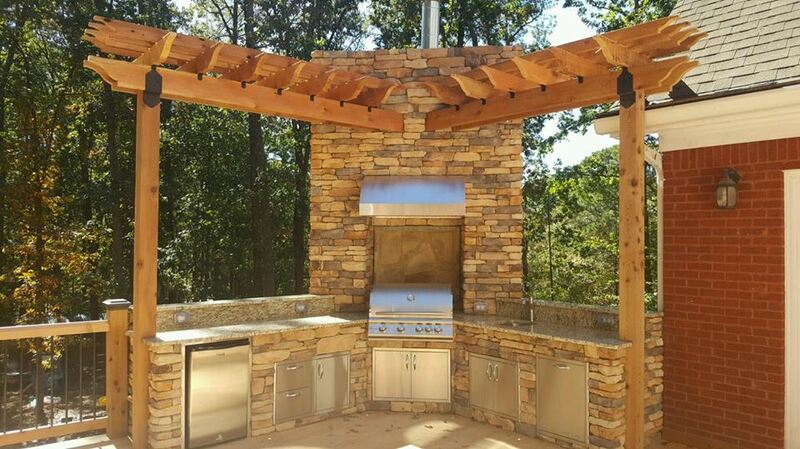 One of our client’s beautiful outdoor kitchens using Stack Stone! Traditional stonemasons would stack stone to build walls and structures of various kinds. They would cut the stone neatly to size and either stack it dry – usually for country garden walls – or with mortar to strengthen the structure. The effect stack stone produces is neat and clean, and reminiscent of centuries-old craftsmanship. Nowadays, there are very few traditional stonemasons worldwide. Not only is this a highly skilled craft, natural stone quarries are few and far between. Stone is also very heavy (and therefore expensive) to transport and it is hard on the hands. In recent years, stone veneer has become a popular alternative to solid stone. Initially, manufacturers made solid faux stone units that could be laid like the real thing. But today, manufactured stone veneer is relatively light and considerably easier to install. It is readily available countrywide and costs a fraction of the cost of natural stone both in terms of transportation and labor. In fact, some stone veneer products have been customized for the DIY market. A sample of our Stack Stone Colors – Check them all out here! The Georgia-based faux stone specialists, Native Custom Stone, produce a range of stone veneer products suitable for indoor and outdoor use. The company’s thin stack stone veneer is particularly versatile in terms of character, thickness, depth, and color. Stack patterns are clean and surprisingly contemporary in effect while appearing authentic at the same time. Technologically advanced, stack stone units are manufactured for use in as many architectural applications you can think of. They offer numerous advantages, one of which is that no concrete foundation is required. This makes the stone stack veneer ideal for remodeling walls, indoor features like fireplaces, and backyard structures like outdoor kitchens and seating. Another advantage is that the faux stack stone can be used as a cladding for almost every surface, including the walls of your outdoor kitchen, old or new. For more information about Native Custom Stone stack stone veneer and other veneer products contact us today.